This business movers’ guide takes you through the key factors to bear in mind when managing your gas and electricity contracts during the move. When relocating your business, the most important thing to know is you’ll be placed on expensive ‘deemed rates’ until an energy contract is secured for the new premises. To save money, it’s best to choose a new energy contract as soon as you can. We can handle all of this for you, including conversations with your supplier and we’ll keep you updated every step of the way. Many energy suppliers have a dedicated team to help businesses when they decide to relocate who can help ensure the transfer goes smoothly. 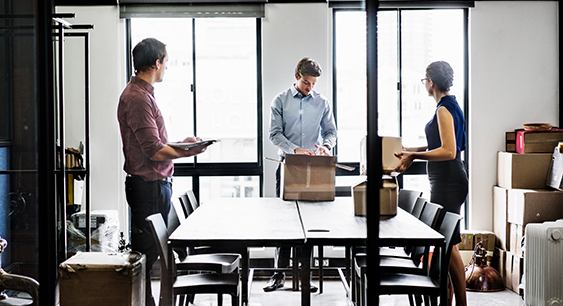 Moving out When moving premises, you’re in the rare position to end your current business energy contract early and run a business energy comparison to see if you can secure a better deal. However, sometimes, your existing supplier can set your new premises’ supply to go live on the date that you move in – minimising the impact on your business, so sticking can be convenient. If you’re choosing to cancel your contract rather than transferring it to your new location, you may want to leave any existing direct debits in place, as there may still be a final bill – or you may be eligible for a refund if you’ve overpaid on previous bills. If you made payment in any other way, any refund you’re entitled to will be paid by cheque. Give your energy provider at least a month’s notice of your planned moving date to help things run efficiently (click here to see our termination letter template) and ensure your final bill is accurate. In some cases, the name of the new owner or business at your old location - they can use this information to help the new occupant set up their energy supply. If you do not have this information, your supplier may ask you to provide contact details for the landlord or managing agent responsible for your old location. The address and postcode of your new premises. If you’d rather your supplier sent your bill to your home address, let them know. You may be asked to provide a Meter Point Administration Number (MPAN) for electricity and a Meter Point Reference Number (MPRN) for gas at your old premises. You can find these numbers on a recent copy of your energy bill - click here to see example bills from a range of suppliers. If you would like more information about your bill, check out our guide to business energy bills. Moving in If you would like to continue using your current supplier at your new address, let them know. You may need to provide the address of your new premises and the date your lease or ownership starts. Your supplier can use your details to find out if they already manage the energy supply at your new location. Your supplier can also tell you whether your current pricing arrangements can be carried over to your new location – this depends on the location and the type of meter installed there. You may also be asked to provide a forwarding address for the previous owner or business at your new location, if you have this information. First, you’ll need to contact the current energy suppliers at your new location to let them know you are switching suppliers. You can find out who the current gas and electricity suppliers are by calling the National Grid. Next, send your supplier the meter readings on the date the supply is switched – your supplier will let you know when this date is. It can take up to six weeks to complete the switch. If you haven’t yet moved into your new premises by the time the supply is switched, you may be given time after you have moved in to provide this reading. Your supplier will then create an energy quote. If you’ve just moved into a commercial rental property, then you’re likely responsible for managing and paying the energy bills at the premises, unless it’s included in your rent. Can I switch gas or electricity supplier if I’m a tenant? Contrary to popular belief, your landlord is not always responsible for your energy bills if you’re renting a commercial property. In this case, your landlord will usually deal directly with your energy supplier, including deciding on energy rates and paying them. The cost of your energy bill will be included within your rent or within general service charges – or sometimes reclaimed from you. If your landlord is in charge of your energy bills, you will not be able to switch suppliers as the energy contract lies with your landlord and not you. If you do wish to change suppliers, you can still request this from your landlord. They’re not obliged to switch, but may do so on your request. Energy use is usually recorded through a gas or electricity meter and your energy bill should consist of a charge per unit, and your share of any standing charge. Please note: As a tenant, you are not obliged to pay any charges related to communal lighting, if applicable. If you pay your energy supplier directly, you’re responsible for the energy bills and are free to switch suppliers to ensure you’re getting a fair deal, as long as you’re acting within the terms and conditions of the contract. Energy suppliers tend to automatically put new tenants onto ‘deemed’ rates, so it’s important to take the time to search for a better deal. This is you’re regarded a financial risk when you move in, because they don’t know how much energy you will be consuming. Deemed rates are far more expensive than any rate you may be offered when you sign up as a new customer. Nonetheless, make sure to check your tenancy agreement before you switch suppliers – you may need to inform your landlord that you are switching, and your landlord may ask you to use their preferred supplier. Reconnection fees If the previous tenant had their supply disconnected – for instance because they did not pay their last energy bill – then your supplier might not provide you with gas and electricity until you pay a connection fee and a security deposit. Connection fees If the premises you are moving into has never had a business energy supply before – for instance if it is a brand-new building – you may have to pay a connection fee to set up the gas and electricity supplies. Early termination fee If you move premises before the contract at your current premises expires, your supplier may charge you an early termination fee, as you are cancelling your contract before the agreed date. Usually, early termination fees are outlined in the terms of your contract, so be sure to check before you arrange to move premises. In some cases, suppliers will waive early termination fees if you continue to purchase energy from them at your new premises. Energy efficiency If you’re interested in exploring energy efficiency options at your new location, it might be worth doing an independent energy audit so you know what needs to be done to maintain energy efficiency. You’re usually given with an Energy Performance Certificate (EPC) by the owner, which provides information on the building’s energy, as well as recommendations for improvement. Feed in tariff If you had solar panels installed at your old premises to benefit from a feed in tariff, you may be able to take them with you when you relocate. This will preserve your feed in tariff payments, so you can continue to reap the benefits of the scheme in your business’s new location. Deemed energy rates Deemed rates are often more than double the cost of those you could be paying with a fair energy deal, it is important to arrange a new deal with a supplier as soon as possible to avoid paying over the odds for your gas and electricity. Remember, you’ll need to give the existing supplier 30 days’ notice of your planned switch. Here are the average daily standing charges and unit rates for "deemed" rates compared with new customer rates. Getting onto a better rate (that suppliers offer to new customers) is straightforward. Our energy experts can compare great prices from our panel of trusted suppliers, getting you onto a better deal. We take the hassle of searching for and comparing tariffs, as well as arranging contracts and dealing with suppliers, leaving you to focus on what’s important – your business. There’s a substantial amount to be saved by switching provider or contract – fill in the form to get started.